Speaking at the Cottonseed Oil and Meal Conclave, SEA President Atul Chaturvedi said that Telangana and Andhra Pradesh are among the leading producers of cottonseed oil. However, the lack of awareness about its usage is a hindrance in increasing its adoption. HIGH DEMAND: Gujarat, Maharashtra, AP and Telangana will benefit from increased usage of cottonseed oil. Hyderabad: Even as Telangana is one of the leading cotton growing States, it lags in manufacture and usage of cottonseed oil for cooking purposes. The Government should adopt a multi-prong approach to increase the cotton cultivation and also popularize use of cottonseed oil. This will benefit farmers as cottonseed is fetching relatively better prices, said industry experts. 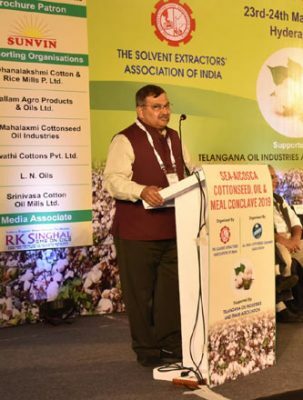 Speaking at the Cottonseed Oil and Meal Conclave, organised by The Solvent Extractors’ Association of India (SEA) and All India Cottonseed Crushers Association and Telangana Oil Industries and Trade Association on Sunday, SEA President Atul Chaturvedi said that Telangana and Andhra Pradesh are among the leading producers of cottonseed oil. However, the lack of awareness about its usage is a hindrance in increasing its adoption. He said the cottonseed oil is preferred oil by the organised food industry, particularly for deep frying, as it has properties that increase the shelf-life of snacks and food items. India now produces about 13 lakh tonne cottonseed oil. In terms of cost, it is comparable to that of soya oil. Gujarat leads in the use of cottonseed oil by consuming about 6 lakh tonnes of cottonseed oil. The State was using more groundnut oil earlier but now has switched to cottonseed oil, he said adding that there is potential to increase the total production manifold in the next five years. Sandeep Bajoria, Chairman, Cottonseed Crushers Association, said India is now the largest cotton producing country in the world after overtaking China and USA. It is now producing between 360-370 lakh bales (170 kg each) of cotton in a year. According to Cotton Advisory Board (CAB), the central government body that estimates production, consumption, import and export of cotton during a season, cotton production in India in the crop year 2018-19 would be 330 lakh bales from 365 lakh bales in 2017-18. The shortfall is due to drought-like conditions prevailed in many cotton growing States. Gujarat, Maharashtra, AP and Telangana will be the direct beneficiaries of the increased demand for cottonseed oil, he said. B V Mehta, Executive Director, SEA, said cottonseed oil is among the most common vegetable oils used in the United States. Referred to as American’s original vegetable oil, it has been a part of American diet since the 1800s, he said. P Koti Rao, Director, Tirumala Cotton and Agro Products, said cottonseed yields valuable by products like cottonseed cake, linters, hulls, soap and free fatty acids apart from oil.